Whoever said you can’t get anything for free anymore hasn’t been to New York City! New York City offers some of the best museums, zoos, galleries and attractions in the world and you can visit dozens of them for free. Though most of the following attractions typically have an admission fee, they open their doors free of charge during certain days of the week (and certain hours). Please note however, donations or “pay as you wish” policies are usually in effect during these free times. Though you are not obligated to pay, a donation will help insure that future generations can enjoy these establishments. It’s recommended that you contact the attraction before going to ensure free admission will be offered during your trip. 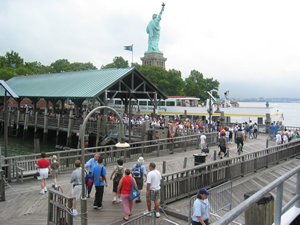 The jumping off point for Ellis Island and the Statue of Liberty, Castle Island explores early New York City military defense. Since it is part of the National Park System, admission is always free. This museum is located on the site where George Washington took his Oath of Office and is dedicated to our first president and to the beginnings of the United States. Permanent exhibits include toy boats, Monopoly, toys soldiers and trophies. There are additional exhibits that rotate throughout the year. This tomb and memorial of General and President Ulysses S. Grant offers plenty to be explored. Explore the history of textile and the art of fashion. A sort of memorial to shopping’s roots. Part of the Smithsonian Institution, the National Museum of the American Indian is dedicated to the preservation, study and exhibition of the life, languages, literature, history and arts of Native Americans. This center features Spanish and American cultural arts and activities. On weekdays, you can experience German language and culture exhibits for free at the Goethe Institut, which is located across from the Met. Don’t forget to bring your German to English dictionary! New York’s only US Army museum located at Fort Hamilton. Learn the history of the Walkman at this entertainment and technology museum. See Lady Liberty up close and personal. Admission is free, but there is a fee for the ferry service to and from the island. Explore how immigrants entered the United States, and more specifically through Ellis Island and New York City. Admission is free, however there is a fee for the ferry to and from the museum. Discover the beauty of this Brooklyn garden. Admission is free on Tuesdays and every weekday from mid-November through February. Admission is free on Fridays for senior citizens. This is a must-see attraction for visitors of all ages. Admission is by donation all day on Wednesdays. Visitors can explore the exhibits of this contemporary art museum. Admission is free on Wednesday and the museum stays open late from 12 to 9 p.m. Enjoy the beautiful wildlife at this garden. Admission to the grounds is free admission on Wednesdays and from 10 a.m. to 12 p.m. on Saturdays. Explore the wonders of how 8 million people get around the Big Apple. Admission is free on Wednesdays for senior citizens. Explore 18th and 19th century European artists at this New York museum. Admission is free the first Thursday of each month from 6 to 9 p.m. This museum is dedicated to the art of decorative and functional pieces and items. Admission is “pay what you wish” from 6 to 8 p.m. on Thursdays. Whether your a kid or just a kid at heart, everyone will enjoy this fun and interactive museum. Admission is free for children on Thursday from 4 to 6 p.m. Admission for adults is by donation. This museum features the cultures and art of the Caribbean and Latin America. Admission is free all day on Thursdays and Saturdays. Explore the art that makes our country such a wonderful place. Admission is free on Fridays from 5:30 to 7:30 p.m. Explore the history and culture of Asian societies. Admission is free on Fridays from 6 to 9 p.m. Admission is by donation on Fridays from 5:45 to 8 p.m. This attraction features a fine collection of continuously changing exhibits dedicated to the photographic arts. Admission is free on Fridays, but donations are requested. Exhibits include collection of 12,000 travel, art, archaeology and human interest photographs. Admission is free on Fridays from from 7 to 9 p.m. Explore the world of modern art at this museum. Free Admission on Fridays from 4 to 8 p.m. Explore the history of the motion pictures. Admission, excluding film screenings, is free on Fridays from 4 to 8 p.m.
Exhibits include artifacts, pictures, and art from New York City’s rich history. Admission is free on Friday’s from 6 to 8 p.m. Admission is by donation on Fridays’ from 6 – 9 p.m. This museum features the stone, metal, wood and clay works by Isamu Noguchi. Admission is free on the first Friday of each month. Admission is free all day on Fridays. Admission is free on the first Saturday of each month from 5 to 11 p.m. Explore the history of the Jewish culture with a focus on the Holocaust. Admission is free on Saturdays from 11 a.m. to 5:45 p.m. Dedicated to exploring black artists’ work from the United States and internationally. Admission is free on the first Saturday of each month. A large collection of a variety of art forms from throughout the ages with a focus on paintings, sculpture, furniture, oriental rugs, porcelains, and Limoges enamels. Admission is by donation from 11:00 a.m. to 1:00 p.m on Sundays. Admission is free from 10 a.m. and 12 p.m. on Sundays.